The N14 postcode covers the area of Southgate. It neighbours on Cockfosters in the North, East Barnet in the West, Arnos Grove in the South and Palmers Green in the East. Oakwood Park, Bramley Sports Ground and Southgate Chase Allotments are pretty much the only green areas in N14. The postcode border however is completely lined by parks from all sides. Broomfield Park, Arnos Park, Brunswick Park, Oak Hill Park and Trent Park are only some of the parks located right on the N14 border and all are easily accessible via walking distance for all the local residents. N14 has only two tube stations. Oakwood Station and Southgate station. They both provide the local residents with access to the Piccadilly line and are strategically placed in order to be very easily accessible to the locals as well. N14 is one of the postcodes that is not to be missed by any company looking to run a leaflet distribution targetting affluent homes in North London. The average income in N14 is slightly higher than the London average and the households here are mostly in Terraced Houses or larger detached homes. There are some larger apartment buildings here that might be difficult for a leaflet distributor to access but they are easily identifiable and have been removed from our mapping system. This is also done for all local authority housing and businesses. 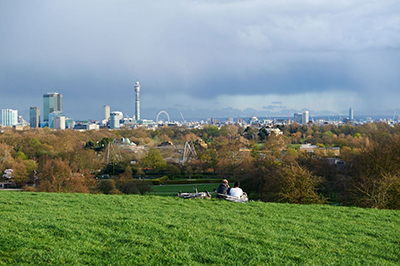 Southgate is a very family friendly area with great schools and as mentioned above access to many green spaces to escape the busy life in the capital. It has become a desirable location for many city professionals looking to buy a larger home in London while still staying well connected to the city centre. In many ways it is very similar in it's character to some of it's North London neighbours like Finchley or Arnos Grove. The fact that most homes here are easily accessible and that the layout of the streets is nice and clear helps in multiple ways. Our GPS systems work the best in areas like this where we know that our distributors will be walking to most homes in the area. If we see that the distributor has not walked up to a building we know that something has gone wrong. This is slightly more difficult to establish in an area with industrial buildings and businesses. It is also easier for our distributors to navigate on the ground. We provide all our workers with maps of areas they will be working in ahead of time and wherever possible we have our Postmen work in their own local areas. No amount of studying can quite make up for real local knowledge. If we operate in areas with difficult terrain with many hills or thousands of stairs that need to be climbed we make sure to not overload our Private Postmen and Women with too many leaflets and areas too large to cover. We don't expect our distributors to cover the same ground in an easy to deliver area compared to more challenging parts of London.